The Regatta of the Ancient Maritime Republics is a sporting and historical rievocation under the patronage of the Italian Republic President. In the Regatta four crews challenge in representation of the ancient Italian Maritime Republics of Amalfi, Genoa, Pisa and Venice. It happens every year, usually in June, and it's done each year in a different city. The real competition is preceded by a historical procession, during which you can see unthread along the roads of the organizing city some actors dressing the ancient characters cloths that characterized every republic. 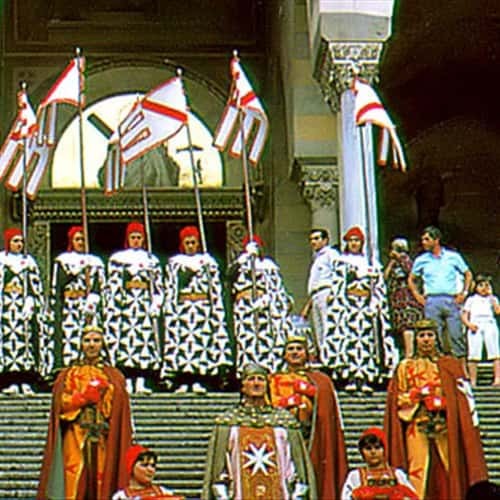 The pisan Mirro Chiaverini had the idea to organize an event to remember the stories of the four Maritime powers. Such idea was born at the end of the 1940s. Carlo Vallini, president of the Pisa Provincial Tourism body, viewed the Chiaverini proposa and turned it to the other cities mayors. The initiative was positively welcomed by the lawyer Francesco Amodio, mayor of Amalfi, who organized a reunion of the four ancient republics representatives. The meeting happened in Pisa on April 9th 1949 but it was not easy to get an accord. Once reached the accord it was begun the study of the statute and a rule by searching in the historical files to realize the historical procession cloths and the boats projects. On June 29th 1955 was organized in Genoa an experimental test of the four rowers boats, called "gozzi". 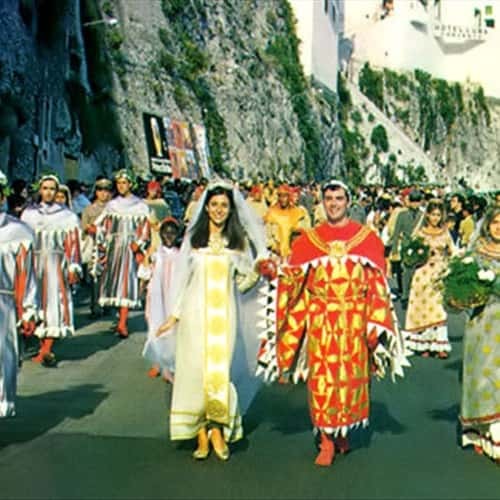 On December 10th, same year, was finally signed, in the Historical Museum of Amalfi, the constitutive action that enacted the creation of the Regatta organizational body. The first edition was in Pisa on July 1th 1956 at the presence of the Republic President Giovanni Gronchi and of the Merchant Marine Ministry Gennaro Cassiani. The Regatta has a statute, that establishes the constitution of the organizational corporate body, its purpose (to promote the rievocation), and its composition. About the rule we can reassume shortly it saying that the competition foresees that the crews are composed by 8 rowers, a helmsman and the reserves. Years ago crews were formed from athletes been born in the respective cities, provinces and regions or resident there from at least ten years, but beginning from 2004 it is established that they has to be composed half by athletes coming from the Region and half by athletes coming from the Province. The boats must be build all with same structural parameters. Their weight has to be at the most of 760Kgs. To respect such parameter the boats, once built in wood, now are realized in vetroresina. Boats are recognizable by the wooden sculptures (now in vetroresina also) set on the bow that represent every city animal symbol and by colors. For this motive, Amalfi boat is identified by the blue color and by the winged horse, the Genoa one by the white color and by the dragon (it is due to St. George, the city protector), the Pisa one by the red color and by the eagle (it symbolizes the ancient bond among the Pisa Republic and the Sacred Roman Empire) and the Venice one by the green color and by the winged lion (it's due to St. Mark, patron of the city). 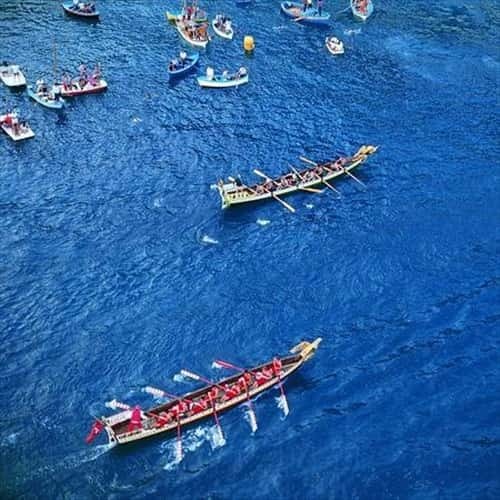 The run of competition is long 2Kms, and it develops in Amalfi and in Genoa in the Tyrrhenian sea, in Pisa in the Arno river countercurrent and in Venice in the characteristic lagoon. Before the beginning of the competition the passages are drawn. It's forbidden, during the competition, to invade the adversary passage. Punishment is the demotion to the last place decreed by the jury. It's allowed, instead, the change only in case a crew is a boat ahead in comparison to an adversary. The historical procession represents the central moment of the whole demonstration. Through of it every Maritime Republic relives in its full past glorious, proposing episodes and characters that marked their history.